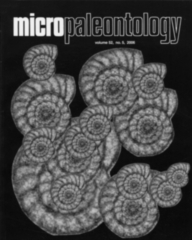 ABSTRACT: A global extinction event of deep-sea benthic foraminifera occurred at the Paleocene/Eocene (P/E) boundary, coeval with a period of rapid global warming (Initial Eocene Thermal Maximum; IETM) and a negative excursion in marine and terrestrial d13C values (Carbon Isotope Excursion; CIE). Benthic foraminifera from marginal and epicontinental basins show lesser extinctions and/or temporary assemblage changes. Detailed taxonomical and quantitative analysis of the benthic foraminiferal assemblages and of the paleoenvironmental turnover across the P/E boundary in the outer neritic Dababiya section (Egypt), the Global Stratotype Section and Point (GSSP) for the P/E boundary, is of great importance for correlation with other P/E boundary sites. We illustrate the 46 most representative benthic foraminiferal taxa (belonging to 27 genera) in order to compare the taxonomy of species described in Egypt with that of species described from other sections worldwide. Angulogavelinella avnimelechi had its uppermost occurrence at the base of the CIE, and its extinction may be correlated to the main phase of extinction of benthic foraminifera (Benthic Foraminiferal Extinction Event, BEE) in the deep sea. At the same level, the species richness and diversity decreased, and the relative abundance of non-calcareous agglutinated foraminifera increased dramatically, probably related to intense dissolution as seen in the lithology. However, dissolution of carbonate was not complete through the whole CIE at Dababiya, and thus may not have been the only cause of the foraminiferal turnover.